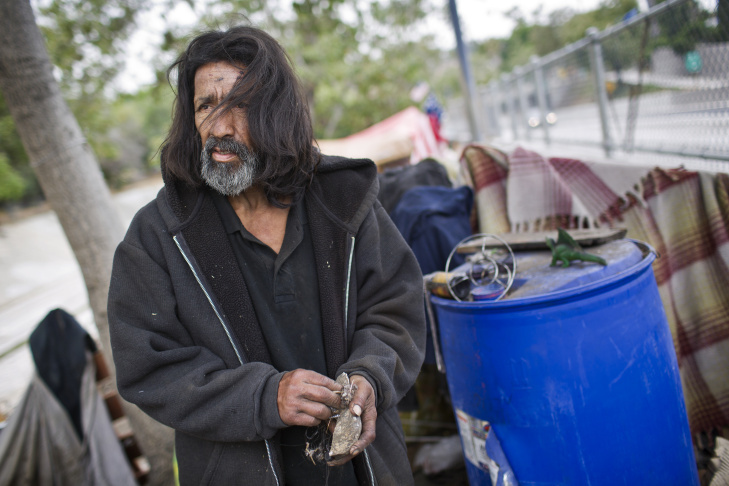 Jesus Torres has lived in the Arroyo Seco riverbed for almost three years. Torres was born in the city of LA during the time of the Watts Riots in 1965. Dozens of encampments have taken root in and around the Arroyo Seco riverbed in the past several years and are now visible along the 110 Freeway. 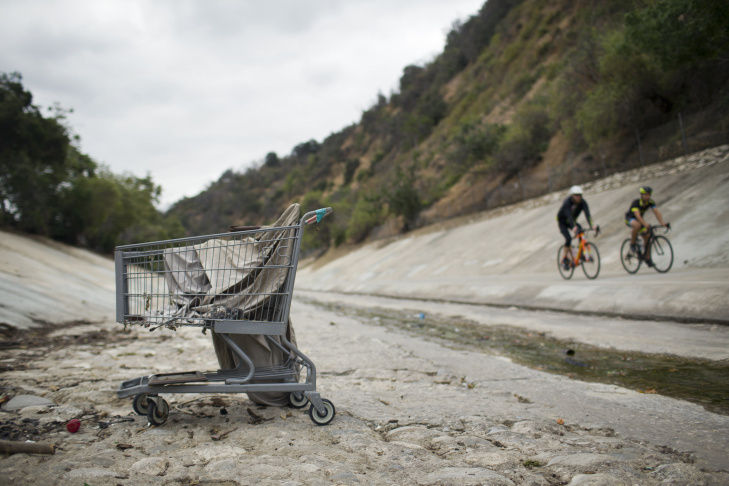 Bicyclists ride the Arroyo Seco trail on Tuesday morning, May 5, 2015 where several encampments line the riverbed. 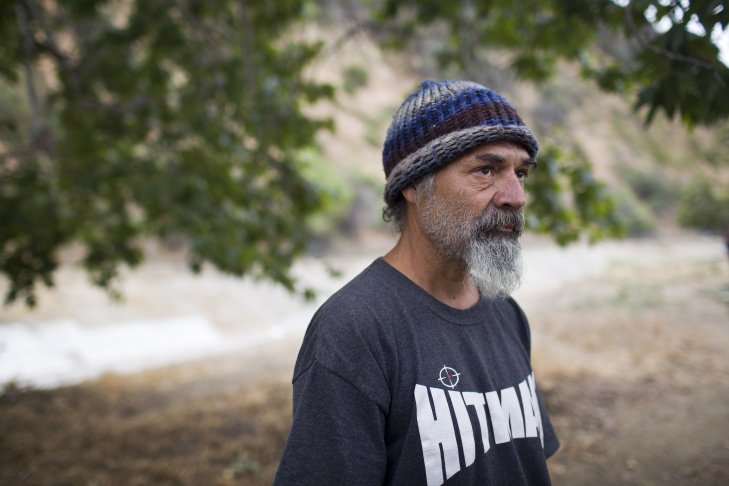 Ronald Armijo and his girlfriend of 20 years, Peggie Sue, have lived in the Arroyo Seco riverbed for six months. Armijo has spoken at public forums appealing to city councils for help in the encampments. Peggie Sue holds her pet turtles, Bonnie and Clyde, inside the tent that her and her boyfriend of 20 years, Ronald Armijo, live in. The tent was given to the couple by their neighbors after their encampment was taken down during a major clean-up by LA sanitation officials in February. 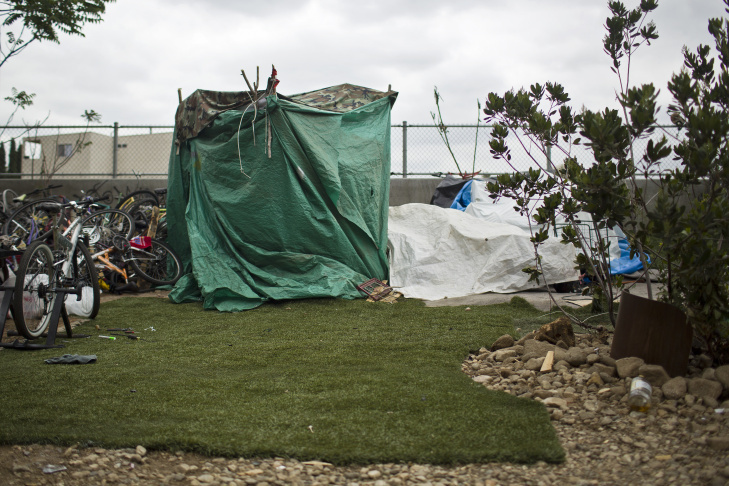 Pieces of artificial turf and rugs surround a tent in the Arroyo Seco riverbed along the 110 Freeway on Tuesday morning, May 5, 2015. Michael Mendez, left, and his wife, Michelle, have lived in the Arroyo Seco riverbed for a year. Michelle Mendez has spent 15 years being homeless in the Highland Park area. Their days are spent recycling, going through dumpsters and setting up yard sales for found items. 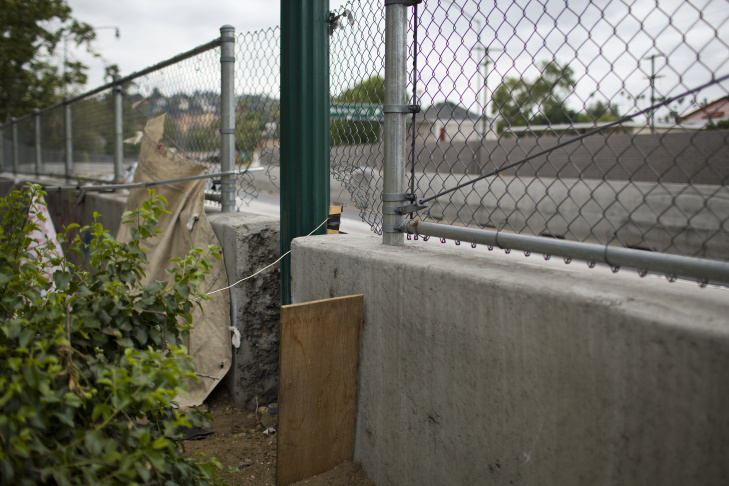 People living in the Arroyo Seco riverbed use this small gap in a concrete barrier along a 110 Freeway on-ramp as an exit. Ronald Armijo explains that the Arroyo Seco riverbed encampments straddle two city council districts 1 and 14. They also straddle the geographic jurisdiction of two different police divisions. 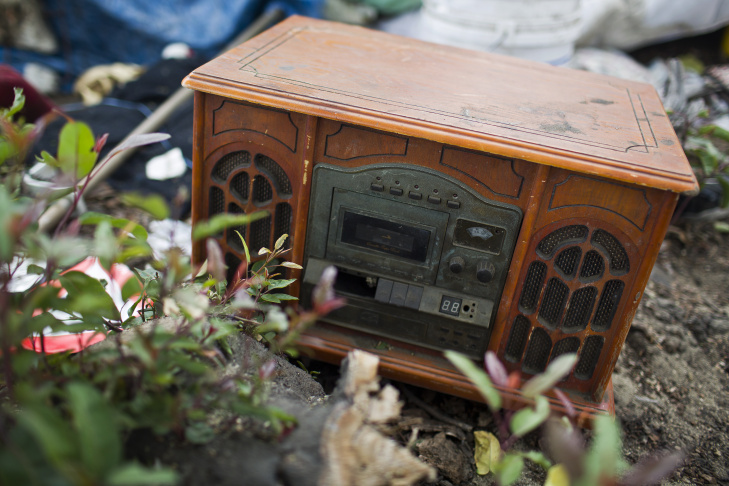 Jesus Torres goes through dumpsters looking for possibly valuable items like this tape cassette player. 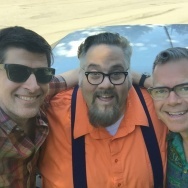 If you’ve driven to Pasadena in the last year, you’ve probably seen them, just to the right of the 110 Freeway: tents, tarps and camps along the banks of the Arroyo Seco. Several times, crews have cleared the camps only to have them reappear later. But what’s it like living there, between a freeway and a creek? Walking down the Arroyo, you notice right away that some of the campsites look more elaborate than others. There are huge tents like you’d find at an REI, and there are tarps pulled over piles of metal. There are landscaped gardens and pet chickens. Some people keep rugs out front, and they sweep them. Michelle Mendez lives underneath a big blue tarp with her husband, Mike. The two have lived along the Arroyo just over a year. In that time, the camps have been cleaned out twice — Michelle says she remembers them both. "Actually, they were really kind of cool about it," she said. "'Cause they let us get all our stuff and they loaded all our stuff into the big shovel, and put it on this side of the river for us. But I figure, better us be here than up there on the streets, you know?" "Most of this — all of this — came from out of somebody’s dumpster," she said. "Yeah, every time I go out to recycle, I’m always finding my wife some part of jewelry," Michael, her husband, said. 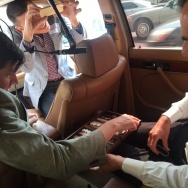 "Some kind of ring, necklace, bracelet, earrings, every single time." The Arroyo winds through a gauntlet of municipal jurisdictions: on one side, there's a city-owned park, on the other there's a freeway maintained by Caltrans. Parts are in L.A. City Council District 1, others are in 14. The camps, which have grown steadily since they were last cleared out in February, are a perennial issue for Los Angeles City Councilman Gil Cedillo, who represents the first council district. "It’s just so glaring," Cedillo said. "That you come down the 110 and you see these encampments and you’re like 'Well, how can this be?'" Residents have worried about crime and public safety around the Arroyo, and campers like Michelle sympathize. "The way I figure it, you can’t be running around here acting like somebody pays your rent," she said. "And you can’t be rude to the neighbors, 'cause they paid their rent." Mendez said officials have asked that she and her neighbors keep the bike paths clear and leave joggers and residents alone, but there's been trouble with that. Not too far from Michelle's place, there’s a bunch of stuff on the edge of the path. It looks like trash, but she says it belongs to her neighbor. Further down the Arroyo, there’s a big yellow tent. 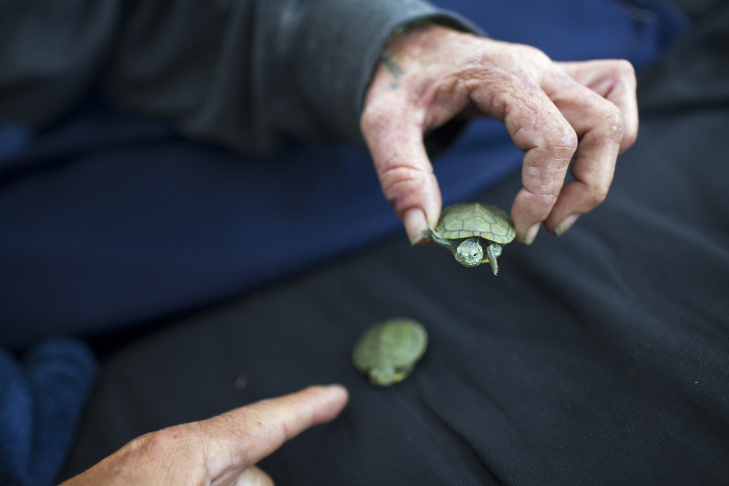 Ronald Armijo lives there with his wife, Peggy and their two baby turtles, Bonnie and Clyde. 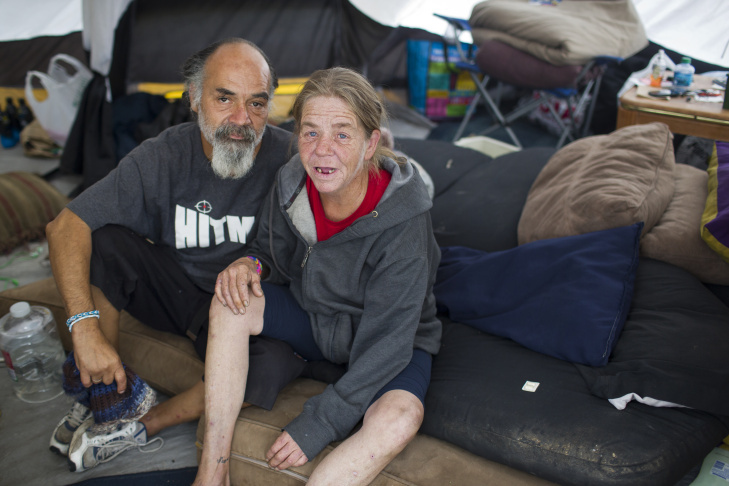 They’ve lived on the streets for a year and by the Arroyo for 6 months. 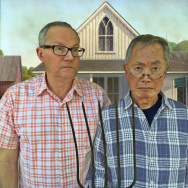 "Everybody here is actually pretty much — 80 percent to 90 percent is a family. If you ain’t got something, we got something. 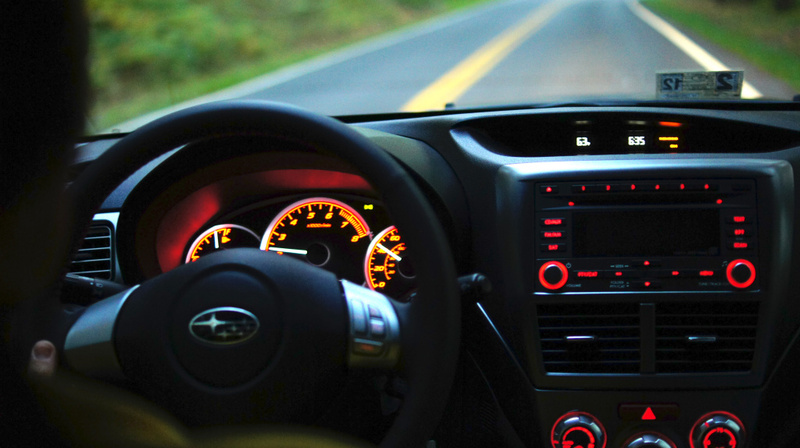 If you need something, we have something," Armijo said. "Like the old story, I guess with the Osmonds: 'One bad apple don’t spoil the whole bunch.'" Ronald’s gone to community meetings to speak on behalf of his family and neighbors. He remembers the last time the camps were cleared and doesn’t have as warm of a memory as Michelle. He said after the camps were cleared out, he and other homeless moved down into the creek bed. "It started raining the first night they threw us down there," said Armijo. "That made it even worse, 'cause now the water’s rising and we’re living there." So what will become of the tents along the Arroyo? Why are they allowed to stay? Councilman Cedillo said the plan for now is to provide as much housing and services as the city can — he stressed that homelessness is a citywide problem. The goal isn’t to keep clearing out the camps, but until there’s a long-term solution, there’s no guarantee they won't continue. Past cleanups have included social workers and homeless service providers to help as many people living in the Arroyo as they can. Meanwhile, residents in the area worry about crime and about fires spreading to the parched brush at nearby Debs Park. When it rains, like it did Thursday night, the park might get greener, the Arroyo might get wider, and underneath the trees, the tents and the tarp, dozens of people will sit out the rain, hoping their shelters will hold. Happy 75th Birthday, Arroyo Seco Parkway! The sub-cult of Billy the Mime, an actual good mime. No, really.